A gourmet Montana breakfast is served each morning in the lovely wainscoted dining room. Entree selections include orange soufflé, gingerbread waffles and Grand Marnier french toast, accompanied by plenty of fresh coffee, assorted teas, fresh fruit, and home-baked breads and muffins. Do linger over coffee to read the paper, swap fishing stories and recount your adventures in Yellowstone and Glacier parks. 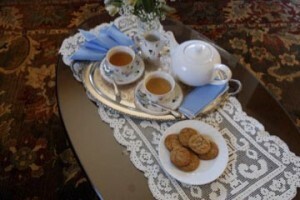 Homemade cookies are available each afternoon, along with sherry, tea,or lemonade, depending on the weather. Browse through the book of menus, assorted guides, and schedule of events to learn about music, museums, shopping and restaurants downtown. Stir together all French toast ingredients except the bread. Set the mixture aside. Melt butter and sauté fruit. Add raspberry jam, triple sec, and nutmeg to fruit. Reduce heat and gently and occasionally stir until fruit is hot. Dip slices of bread in egg mixture, coating both sides thoroughly. Cook on griddle or in skillet over medium heat until both sides are brown, turning just once. 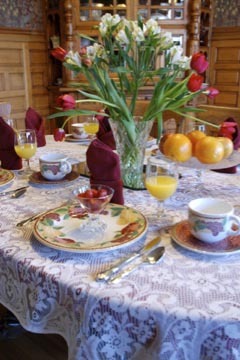 Place French toast on serving plates and glaze with 1/2 to 3/4 cup sautéed fruit. Sprinkle with powdered sugar. Serves 8.